Lớp Học Sơ Tán (Class at Evacuation)painted in 1968. The painting is displayed at the Việt Nam Museum of Fine Art. The life and times of the famous artist Thang Trần Phềnh have been written about in a new book by Ngô Kim Khôi. Thang Trần Phềnh lived from 1895 to1972. He started to be interested in art at the age of twelve. By the time he was fifteen, his work was being shown in Hà Nội. Artist Thang Trần Phềnh was not only one of the first Vietnamese artists to graduate from the École des Beaux-Arts de l’Indochine (Indochina Fine Arts College) — the first fine arts school in Indochina — he was also among the first to display his oil-on-canvas paintings at expos held in Hà Nội in the early 20th century. A new book entitled Thang Trần Phềnh by author Ngô Kim Khôi launched recently in Hà Nội and HCM City portrays Phềnh with 28 of his paintings in various mediums. Phềnh (1895-1972) was among the masters of Vietnamese modern arts in the early 20th century. "Phềnh was one of those unknown artists and not many people knew much about him or his work," said fine arts critic Phan Cẩm Thượng. "Under the instruction of French priest Leopold Cadiere, Phềnh did illustrations for the Huế Art magazine. 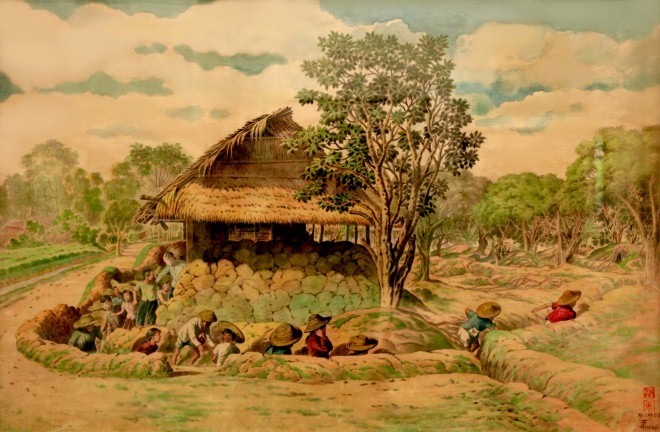 His illustrations for the magazine and his watercolour paintings about Vietnamese life in the early 20th century showed his excellent realistic painting skills." Phềnh was born in Hà Nội to a half-Chinese father and Vietnamese mother. His father was a clerk while his mother was a seamstress. Phềnh started showing an aptitude for painting at the age of 12. His father bought him materials to practise and he learned to paint by himself from French magazines and books. He also learned to design posters and stages from Chinese art troupes that came to perform in Hà Nội. At the age of 15, his painting Chùa Trấn Quốc Trước Khi Mặt Trời Lặn (Sunset in Trấn Quốc Pagoda) was shown at an expo in Hà Nội in 1911. After that his paintings became popular among French expatriates who commissioned him to paint. Growing in confidence, he held prize-winning exhibitions in the capital between 1911 and 1915. After finishing high school he worked with theatres and magazines on set design and illustrations. In the early 20th century, western techniques and the French in particular were unfamiliar to Vietnamese artists, but Phềnh studied oil-on-canvas guided by French fine arts professor Gaston Leloup. His first oil-on-canvas featuring national heroines Hai Ba Trung (Trung Sisters) won a Fine Arts prize at Hội Khai Trí Tiến Đức (Intelligence Development and Virtue Advancement Association) in 1923. In 1925, when the Indochina Fine Arts College opened, Phềnh applied for professional training despite being well-known. However, he was rejected and his failure raised questions about the conflict between east and west painting styles. A year later he was accepted by the college, and graduated in 1931. 1931-1933 was a milestone in his career. Silk painting Đánh Bài Tam Cúc (The Card Game) was displayed at the Grand Palace of Champs Elysees. The painting was auctioned for nearly SG$20,000 (US$14,500) by Christie’s in 2000 to the Singapore National Heritage Board. Another silk painting entitled Xem Bói (Fortune Telling) was honoured at an exhibition in Rome in 1931. His oil-on-canvas [national hero] Phạm Ngũ Lão (1923) and Chân Dung Phụ Nữ Lào (Portrait of a Lao Woman) 1927, and silk painting Lớp Học Sơ Tán (Class in Evacuation) 1968 are at the Việt Nam Museum of Fine Arts. Chân Dung Phụ Nữ Lào shows the artist’s skillful technique that he learned at the fine arts college. "Phềnh’s career was not only about painting," critic Thượng wrote in the book. "After graduating from the arts college he became more active in stage design and this helped him gain fame." He also set up a troupe with child singers and toured Hà Nội, Hải Phòng and Nam Định from 1931 to 1943. At the end 1946, he joined national resistance against the French. The artist worked as a designer at Chuông Vàng Theatre from 1954 to 1963, and was a member of the Việt Nam Fine Arts Association from 1957. His works cover wide ranges such as silk, oil-on-canvas, Chinese-ink, and watercolour. The book on Thang Trần Phềnh’s life was published by Mỹ Thuật Publishing House and took author Khôi 10 years of research to complete. Khôi is artist Nam Sơn’s maternal grandchild. Artist Nam Sơn (1890-1973) was a co-founder of the Indochine Fine Arts College with French professor Victor Tardieu. The writer has been living in France since 1985. "It would be a huge mistake if Thang Trần Phềnh is not mentioned in Việt Nam’s fine arts development," said Khôi. "He and other Vietnamese masters made great contributions to lay the foundations for modern Vietnamese fine arts. Mediums are ways of painting, such as oil painting, water painting, pastel and so on. Fine art is creative art. His father was a clerk while his mother was a seamstress. A clerk is a person who works with documents, in an office. A seamstress is a woman who sews clothes as her job. He also learned to design posters and stages from Chinese art troupes that came to perform in Hà Nội. Troupes are groups of artists. After that his paintings became popular among French expatriates who commissioned him to paint. Expatriates are people who live in a country for a while but come from other countries. Techniques are ways of doing things. If techniques are unfamiliar to Vietnamese, they are not used to doing things that way. Heroines are women who are heroes. However, he was rejected and his failure raised questions about the conflict between east and west painting styles. To reject something means to turn it down. 1931-1933 was a milestone in his career. A milestone is a significant moment in a journey. The painting was auctioned for nearly SG$20,000 (US$14,500) by Christie’s in 2000 to the Singapore National Heritage Board. When something is auctioned it is sold to the person who offers the highest price. Khôi is artist Nam Sơn’s maternal grandchild. Artist Nam Sơn (1890-1973) was a co-founder of the Indochine Fine Arts College with French professor Victor Tardieu. Maternal means to do with one’s mother. "Information about him is scarce. If something is scarce there is not much of it. A city in Europe where a silk painting entitled Xem Bói (Fortune Telling) was honoured at an exhibition in 1931. The country in which author Ngô Kim Khôi lives. The job that Leopold Cadiere did. A country whose National Heritage Board bought the silk painting Đánh Bài Tam Cúc (The Card Game) and displayed at the Grand Palace of Champs Elysees. Things with lots of words in them that people read. 1. Rome; 2. France; 3. Priest; 4. Singapore; 5. Books.